This text provides examples of philosophy of religion in real world situations - which open each chapter. It offers relevant coverage to undergraduates, taking as it does, a multi-faith approach to the subject: thinkers and traditions are brought together in the examination of a philosophical question. - Publisher The SCM Core Texts are a collection of textbooks designed to help undergraduates at level two and three navigate their way through a variety of subjects. Covering philosophy of religion, religious studies, biblical studies and theology, they aim to offer students an intelligent helping hand in their core areas of study. Each book is designed individually and places an emphasis on pedagogical tools to aid the learner. These tools vary according to suitability across the subjects covered, but include features such as questions for reflection at the end of chapters, textboxes to further explain concepts or provide examples, some web-based materials on companion web-sites which are freely accessible. The textbooks are intended to be used as core reading on undergraduate courses, and as companions to assist lecturers in their classrooms and are all available on the SCM inspection copy scheme. Spiritual encounters and the problems raised by evil and suffering are the experiences that affect our religious beliefs most powerfully. 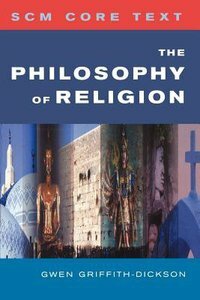 In this far-reaching textbook on the philosophical study of religion Gwen Griffith-Dickson fills a gap in the market by considering these questions in the context of the world's many religions and philosophical traditions, giving attention to Continental European and Eastern philosophy as well as to Anglo-American thinking. This is the only textbook of its kind to offer the reader such a wide and inclusive overview of contemporary philosophical study of religions. About "The Philosophy of Religion (Scm Core Texts Series)"
The SCM Core Texts are a collection of textbooks designed to help undergraduates at level two and three navigate their way through a variety of subjects. Covering philosophy of religion, religious studies, biblical studies and theology, they aim to offer students an intelligent helping hand in their core areas of study. Each book is designed individually and places an emphasis on pedagogical tools to aid the learner. These tools vary according to suitability across the subjects covered, but include features such as questions for reflection at the end of chapters, textboxes to further explain concepts or provide examples, some web-based materials on companion web-sites which are freely accessible. The textbooks are intended to be used as core reading on undergraduate courses, and as companions to assist lecturers in their classrooms and are all available on the SCM inspection copy scheme. Spiritual encounters and the problems raised by evil and suffering are the experiences that affect our religious beliefs most powerfully. In this far-reaching textbook on the philosophical study of religion Gwen Griffith-Dickson fills a gap in the market by considering these questions in the context of the world's many religions and philosophical traditions, giving attention to Continental European and Eastern philosophy as well as to Anglo-American thinking. This is the only textbook of its kind to offer the reader such a wide and inclusive overview of contemporary philosophical study of religions. Gwen Griffith-Dickson is Head of the Centre for the Interdisciplinary Study of Religion, Faculty of Continuing Education, Birkbeck University of London.